1. Melt the butter in a heavy-based saucepan, add the onion and fry on a low–medium heat, stirring often, for 20 minutes until caramelised. Add the garlic and cook for 2–3 minutes. Stir in the cornflour and 2 tablespoons of stock and cook out over high heat for 1 minute, making sure there are no lumps. 2. Deglaze the pan with the wine and brandy and flambé. To flambé, tip the pan carefully away from you but towards an open flame, allow the vapours to ignite and keep the pan at arm’s length. Allow the alcohol to burn off naturally before you continue cooking. 3. Add the remaining stock and the stock cube and bring to the boil. Reduce the heat to low and simmer for 30 minutes until reduced and thickened. Season with salt and pepper and then ladle into six 200ml ovenproof ramekins. 4. For the topping, toast 6 baguette slices, then rub with the garlic clove. 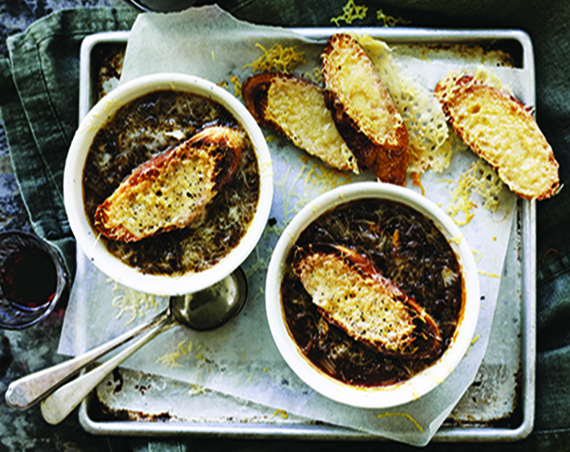 Place a baguette slice on top of the soup and sprinkle evenly with the grated cheese. Finally, place a chunk of Gruyère on the grated cheese and grill until golden brown.